An idyllic 2 bedroom cottage near to breath-taking beaches with enclosed quaint patio garden and parking all set in the grounds of a 250 year old farm house with a long history in the quiet, seaside village of Manorbier. Barafundle cottage is set in 10 acres of rolling grounds which have wonderful sea views of both Manorbier and Skrinkle bay. A short walk through the meadow will bring you within a stones throw of the village of Manorbier where you can find an excellent shop, handy post office, relaxed pub and delightful tea rooms including a beautiful seaside gift shop. Manorbier is a village with a wealth history, also featuring a beautiful castle with spectacular views of the bay, a picturesque church and not forgetting the stunning, secluded beach with parking in walking distance. It is just 4 miles to the historic walled town of Tenby, with a bus service running near-by, all amenities can be acquired from here with a wide variety of restaurants, pubs, cafes, shops and a supermarket available. Pembrokeshire boasts a wealth of other beautiful beaches and places of interest including Bosherston Lily Ponds and Pembroke Castle all just a short drive away and not forgetting the enormous variety of fun days out on offer for the family including, Folly Farm, Manor Park, Heatherton, the Dinosaur Park and Oakwood. The cottage is named after the highly celebrated beach – Barafundle, widely praised as one of the most beautiful beaches in the UK. The cottage, which is across one storey, has been styled with the beach in mind, capturing the essence of the sea with locally sourced art and decorations. It is a centrally heated 2 bedroom bungalow with an open plan lounge, kitchen and dining area. There is an enclosed, gated, beautiful garden with patio, furniture and barbeque to the front of the property. Entrance is into a welcoming porch leading to the lounge and kitchen. The newly fitted kitchen is well equipped with electric oven and hob, fridge/freezer, microwave and slim line dishwasher. A spacious lounge with TV (freeview) and DVD has views out onto the garden area. Two double bedrooms one with double bed and one with an adult size bunk bed, all with excellent quality bed linen provided and made up for your arrival. The Family bathroom has an elegant drench shower over a bath, toilet, sink and heated towel rail. The whole cottage has been thoughtfully redecorated and designed this year (2018) to create an idyllic hideaway. Free Wi-Fi is available throughout the accommodation. Please visit our website to see more details about the site and our renovations, you may also be interested in learning about our dedication to having a low environmental footprint, our ethos for our site and our fantastic range of hampers that you can pre-order to be delivered to your cottage during any day of your stay! Every morning you have two choices: continue to sleep with your dreams, or wake up and chase them. And that is just what we did… We are Russell and Llinos Jones, we took the plunge in August 2017 and bought Wynd Hill, the dream we’d always had, and now here we are! After years of wondering and wishing we might be brave/lucky/crazy enough to take the leap, move back west and pursue our dreams – we finally did it. We arrived one hot summer with our nearly 2 year old son, Evan, and three weeks later (!) we welcomed our second son, Macsen, to the world and our new life. The dream began with a longing to return home – Llinos is born and bred Pembrokeshire, and Russell (a Caerphilly boy) who had spent most of his childhood summers down here by the beach shared this dream. When we spotted Wynd Hill for sale it felt like fate, many years ago Llinos’ own parents had viewed the place as a prospective family home but it was too much of a project back then, today it still feels like a project but one we relish and are excited to develop. We reopened with a new name – Wynd Hill Hideaway in June 2018 on the beginning of a long road to create the vision we have for this place, our home. We hope you will come and share this idyllic spot with us as we strive to reach it’s full potential. Then you will see our dedication to making a true ‘hideaway’, a small bit of paradise by the sea, a place for everyone that is in tune with the world around it and embraces the Pembrokeshire lifestyle. Hideaway with us. A small, family friendly site just a stones throw from some of the most beautiful beaches in the county. We include three superbly redesigned Welsh cottages, an idyllic campsite with 15 pitches, 10 electrical hook ups and a newly improved toilet block. Our large meadow gives space to enjoy the peace of the countryside, while en route conveniently to Manorbier village and the Pembrokeshire National Coast Path - both just a short stroll away. With Tenby and all the amenities it provides just a 15 minute drive or bus journey away - what more could you need?..... With the cottage being part of a complex of three with a connected campsite, your more than welcome to book multiple cottages / pitches for those larger groups of friends and family. Lovely cottage very comfortable and clean. Great location to explore Pembrokeshire from. Great cottage in a good location for exploring Pembrokeshire from. Clean comfortable and cosy. Very tastefully decorated lovely welcome pack milk in a bottle and eggs from their own chickens and delicious Welsh cakes. 10 minute walk into Manorbier lovely castle and great beach from there you can access the Coastal path. We have just got back from a wonderful 4 day stay at Barafundle cottage. The cottage is lovely and very well equipped. The owners live on site and are very friendly and helpful. A nice welcome basket of tea, coffee, sugar, milk and fresh eggs from the owners chickens and even a treat for our dog. This is a lovely place to stay, very peaceful and only a short walk to Manorbier village and beach. There are many lovely beaches and places to visit and Tenby is only a short drive away. We would definitely stay here again next time we come to Wales, you will not be disappointed with this lovely cottage, we would highly recommend renting Barafundle cottage to anyone. Thank you so much Julie for this fantastic review! The owners could not have done more to accommodate our requirements and make us feel welcome. My son was delighted to have a birthday gift waiting for him in his room!! The cottage has everything you could wish for and owners nearby if there was anything we needed. Furbished to a very high standard it exceeded our (high) expectations. An easy 10mins walk to the lovely manorbier village and the beautiful coastline. A great location close to so many great things to do and right by the Pembrokeshire coast path. We will return, thank you! Thank you for taking the time to write such a lovely review, we're so pleased we were able to add some magic to your son's birthday and make it an even more special break for you all. What a lovely review Colin, thank you for sharing! 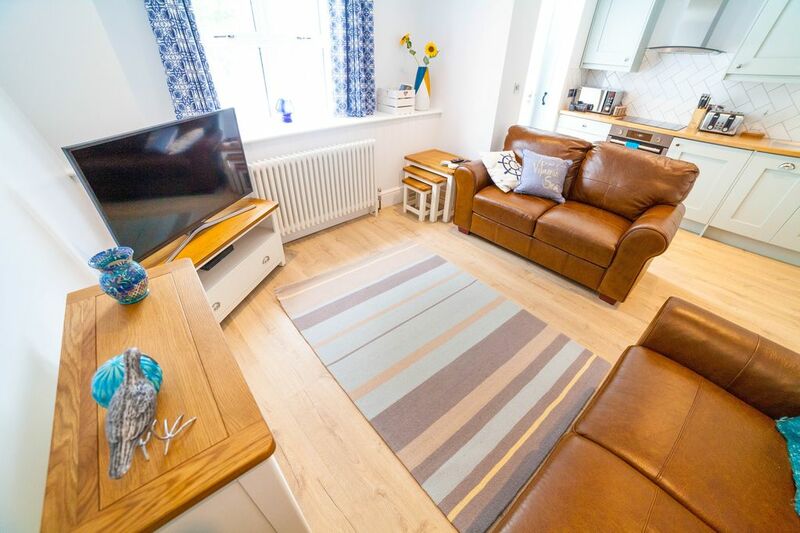 Stunning cottage, beautifully furnished, good specification throughout. What a gem this cottage is. So comfortable and cosy, a real home from home. The setting is lovely, within easy reach of amazing walks both long and short. We were treated to local produce in a thoughtful welcome hamper, even our dogs were catered for! Would highly recommend. Thank you Aileen for this great review, we're so glad you had a nice stay with us and enjoyed your welcome hamper.